With longer lifespans come unique concerns for older adults. Why can't I put on weight? Is it the beginning of your Marfan journey? Latasha Doyle is a full-time writer living outside of Denver with her husband and six fur-babies. When she’s not writing or playing with her pets, she enjoys crocheting, Netflix marathons, and planning her next trip. She also just happens to have Marfan syndrome. Isaiah Austin, who was diagnosed with Marfan Syndrome in 2014, left the NBA draft to better care for himself and the effects of his condition. But yesterday, November 30, 2016, Isaiah announced that he was beginning to pursue his dream once again. About six months ago, I made the decision to “retire” from my career as a full time nanny at the ripe old age of 27. I didn’t make that decision because it was time to move on, or because I was just so over being a nanny - quite the opposite in fact. I retired because my body could no longer keep up with the kids I cared for. I retired because Marfan syndrome wasn’t going to let me do the work I loved any longer. As an individual with Marfan syndrome, you've most likely had that awkward encounter with a coworker, classmate, friend, or even family member where you have to explain your condition. Sometimes, even after you've disclosed the information, they just seem to forget that you've actually got a condition that can affect nearly every aspect of your life. From a very young age, I understood that I was not like other kids. I knew that I had eyes that didn’t see very well, and lungs that didn’t breathe very well. I knew I was tall and skinny, and that I was not able to participate in physical education like the rest of the kids. I knew there was something wrong with my heart, and that’s why I couldn’t play too hard or be on the volleyball team. 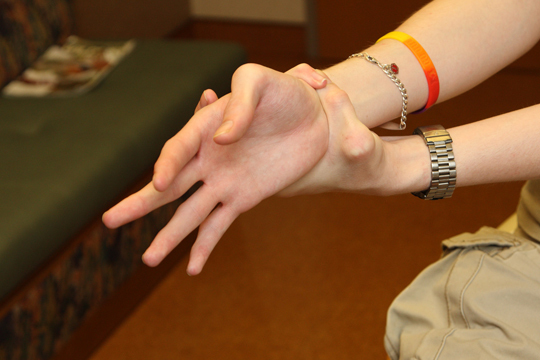 I knew I had Marfan syndrome, and I knew that it made me different. Despite all that, I managed to live a normal life.